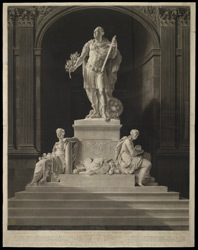 Aquatint of the statue of Lord Cornwallis in Calcutta, published by George Dawe in 1803 and part of King George III's Topographical Collection. The eight ft high statue of Charles Cornwallis, Governor-General of British India from 1786-1793, was erected by the British inhabitants of Bengal, and the first statue in Calcutta. On either side of him are figures of Fortitude and Prudence. Lord Cornwallis (1738-1805) had participated in most of the major campaigns of the American War of Independence before arriving in India. He was an energetic administrator whose brief was to reform his administration, render it efficient and tackle its corruption. He led the military campaign against Tipu Sultan, the strong ruler of Mysore in South India, in the Third Anglo-Mysore War (1790-92) which the British won, and forced Tipu to cede half his territory and pay a large indemnity. He was made the first Marquess of Cornwallis for his services in India in 1792. He returned to India in 1805 to take up the post of Governor-General for a second time but died shortly after. His toga-clad statue, the work of John Bacon, is now in the Victoria Memorial at Calcutta.